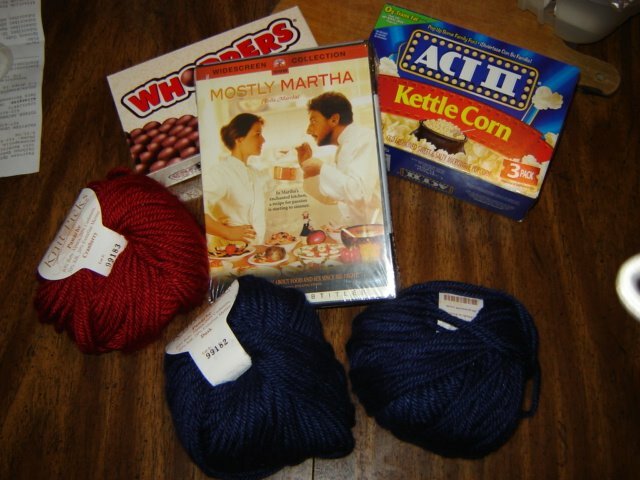 My Knitflix package was on my doorstep yesterday. A very welcome distraction for a challenging afternoon. 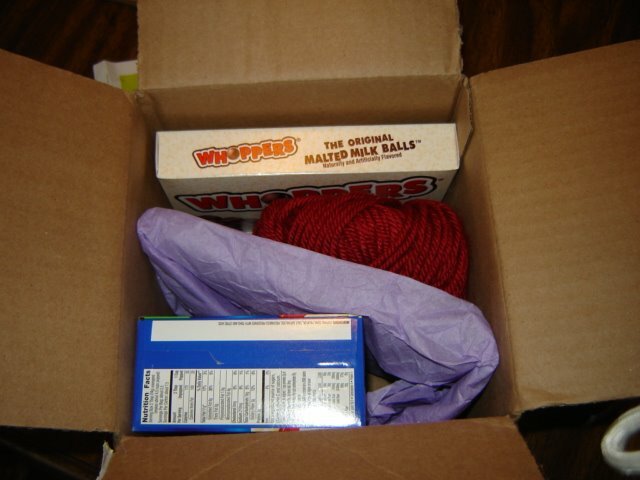 My swap partner, Cecily, did an awesome job of putting together a package! Mostly Martha couldn’t be a more perfect movie: A German flick that involves food and romance. Can’t beat that! I’ll be watching it this weekend, enjoying my yummy treats and some incredible yarn. Cecily, you totally read my mind. 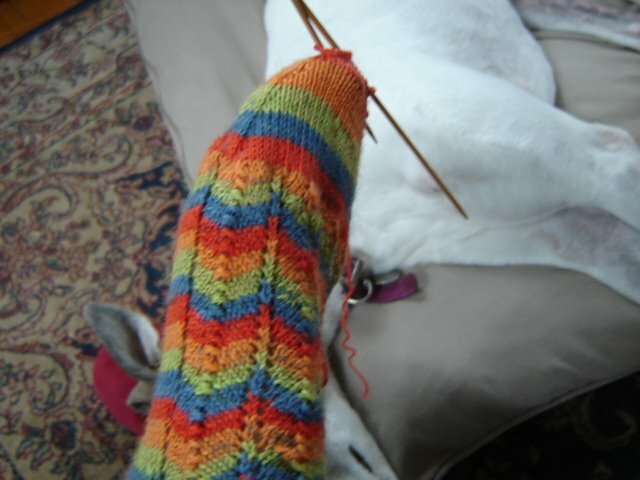 I’ve been meaning to try Panache from Knitpicks. Even better, the colors are perfect for the boys. I see new hats on the horizon. I’m beginning to realize, especially with two kids now, you can never have too many hats and mittens. 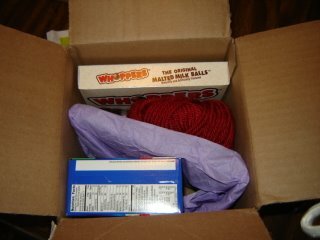 Thank you so much Cecily, you did a great job and I love my package! I’m getting started on my first SP9 package to send out. I really do love these swaps. I love trying to figure out the perfect package to send, and it’s so nice to get spoiled myself, getting a chance to try things I might not normally think of or never get the chance to pick up. There are so many fun swaps to do, but I was thinking last night, has anyone ever seen a Knitters coffee swap? I’ve seen tea, chocolate, but not coffee. How can there not be a coffee swap? I was thinking, if there wasn’t one already maybe I’d host one, but it could turn into one of those “what was I thinking I don’t have time for this” things. Hmmmm……but a coffee swap……anyone think there is actually enough interest out there? Lemme think about it. On to Socktoberfest. Mountain Peaks sock #1 done (except for grafting). Don’t you hate that no matter how you take your sock photos, your leg seems to double in size? 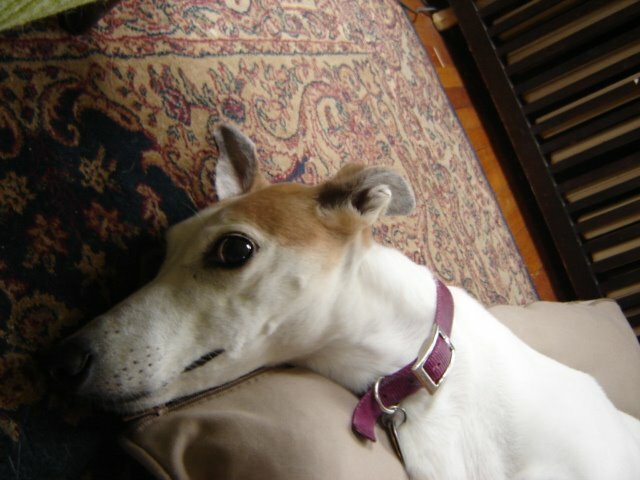 Sorry Gracie, it was the only halfway sunny spot in the house. My favorite LYS is a combination yarn shop/coffee shop. It is wonderful- the yarn smells like coffee! I love just sniffing the yarn when I bring it home- yummy! 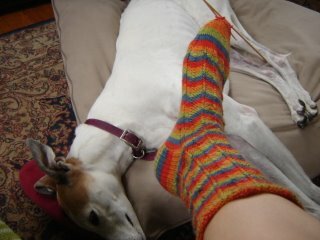 BTW, love your sock- so cheery! Love that pupper’s face. I have to say I am envious of all the swap action going on. I need to get in gear. I think a coffee swap is a great idea! There are so many “regional” brews that it could be fun for people to try some new caffeine. No way to avoid the leg thing, is there? Coffee swap? I am so in. Yum. Your sock looks fabulous – I love the colors. Your socks turned out great – such bright happy colours! Thanks for the link to Panache, I know I’ve seen it in the catalog, but didn’t pay much attention to it at the time! A coffee swap would be great!! YUM. There’s been tea, and as you said, chocolate, swaps. But no coffee, so it would be fun! I’m not sure I could participate because I don’t really drink much coffee though. Very nice sock. And no you can never have enough hats and mitten with little ones around. I have a trick for making mittens for my grandsons. I make 6 pr all the same. That way mom can always find a matching pair. Great idea, there are so many differnt types of coffee (and coffee drinkers) around the world.